Deepening global crises surround us. We are beset by climate change, fracking, tar sands extraction, GMOs, and mass extinctions of species, to say nothing of nuclear weapons proliferation and Fukushima, the worst nuclear disaster in history. Many of us fall prey to despair even as we feel called to respond to these threats to life on our planet. Authors Joanna Macy and Molly Brown address the anguish experienced by those who would confront the harsh realities of our time. 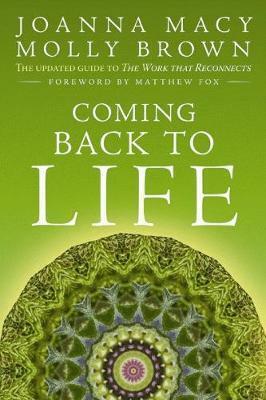 In this fully updated edition of Coming Back to Life, they show how grief, anger, and fear are healthy responses to threats to life, and when honored can free us from paralysis or panic, through the revolutionary practice of the Work that Reconnects. New chapters address working within the corporate world, and engaging communities of color as well as youth in the Work. The Work that Reconnects has spread around the world, inspiring hundreds of thousands to work toward a life-sustaining human culture. Coming Back to Life introduces the Work's theoretical foundations, illuminating the angst of our era with extraordinary insight. Pointing the way forward out of apathy, it offers personal counsel as well as easy-to-use methods for group work that profoundly affect peoples' outlook and ability to act in the world. Joanna Macy is a scholar, eco-philosopher, teacher, activist, and author of twelve previous books including Coming Back to Life. Molly Young Brown is a teacher, trainer, counselor, and author of four previous books on psychology and Earth-based spirituality. Coming Back to Life gives voice to our generations' psalms, praises, and lamentations, our call for justice. It provides practices and meditations so we can make sense of who we are. This book is our wisdom text. Carolyn Raffensperger, executive director, Science and Environmental Health Network, co-founder, Women's Congress for Future Generations. DEEPENING GLOBAL CRISES surround us, causing many to fall prey to denial and despair. Coming Back to Life shows how grief, anger and fear are healthy responses to the harsh realities of our time, and that when honored through the revolutionary practice of the Work That Reconnects, they can free us from paralysis and move us toward creative action. This new, completely updated edition of the classic text illuminates the extraordinary Work that has inspired hundreds of thousands to make strides towards the creation of a life-sustaining human culture. Authors Joanna Macy and Molly Young Brown introduce the Work's theoretical foundations, revealing the angst of our era with remarkable insight. Pointing the way forward out of apathy, they offer personal counsel as well as easy-to-use methods for group process that profoundly affect people's outlook and ability to act in the world. JOANNA MACY, eco-philosopher and root teacher of the Work That Reconnects, has authored 13 books including World As Lover, World As Self . MOLLY YOUNG BROWN, teacher, trainer, and life coach, has authored and edited 6 books, including Growing Whole: Self-Realization for the Great Turning . Chapter 2: The Greatest Danger - The Deadening of Heart and Mind What is Pain for the World? What Deadens Heart and Mind? Chapter 11: The Work That Reconnects with Children and Teens What Do Children Know and Feel? Part Three by Adelaja Simon, Adrian Villasenor Galarza and Andres Thomas Conteris. Joanna Macy is a scholar, eco-philosopher, teacher and activist who has developed an international following in over 30 years as a speaker and workshop leader on Buddhist philosophy and the deep ecology movement. She is the author of 8 books including the original Coming Back to Life and Widening Circles, and she has produced a 3-DVD set entitled The Work that Reconnects. Molly Young Brown has been a trainer, workshop leader and consultant for many years. The author of three previous books on spirituality and healing the environment, including Growing Whole: Self-Realization on an Endangered Planet, she teaches at the Graduate School of Holistic Studies at John F. Kennedy University, and is based in the San Francisco Bay area.